What a game on Hockey Night in Canada tonight. The Leafs come back from 2 goals down just after the Habs did it to them to win 6-5. It was the most intense game since game 7 of last year's cup final. Islanders can still leapfrog over the leafs tomorrow, and Colorado could still catch Calgary, but other than that its set in stone. This is the best time of year. 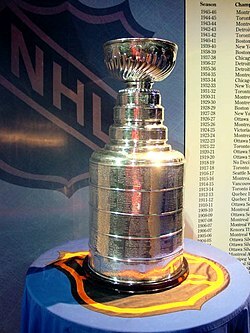 In sports, there is nothing better then NHL playoff hockey. hmm, that location say it all. Go back to watching Nascar. Me neither, but its a necessary evil. Amen, and I'm not really even a Hockey fan. Let's Go Rangers!!! yea baby its the playoffs!! YEA 2-0 WHOO HOO!!! Let's Go Rangers!! Put a fork in my Wild. Damn.